Using food to sooth sad feelings or cope with stress can be unhealthy for both parents and their children. 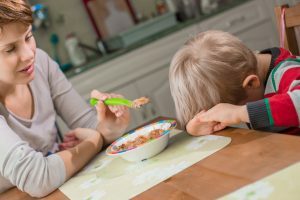 A recent research study on young children in Norway (Emotional Feeding and Emotional Eating, 2017) brings attention to the common use of food to cope with negative feelings. The authors surveyed parents of over 500 children over 5 years (ages 4-8) and propose that as parents we “set the stage” by modeling a relationship with food that our children will often continue. It is normal to find comfort and enjoyment in eating, but using food in response to all bad feelings often creates unhealthy habits. Help kids tune into their body signals – eat when hungry and stop when satisfied. Wait 20 minutes before having second helpings. Discuss emotions with children and help them try non-food ways to sooth negative feelings. Include fun foods or treats regularly (maybe 2-3 times per week) and try not to use them as a reward or comfort.